Back in the ’80s before all the usual online dating apps that are available online, there used to be a dating agency advertised on the back of TV guides. 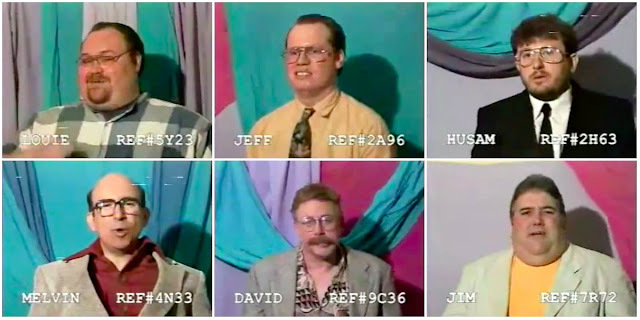 Here, below are some hilarious 1980s dating agency clips that feature a group of desperate-for-love men. The men include a very sweaty Louie, who has a thing for ribs; a geeky-looking Turk; and Jim, who’s decided that “looks aren’t important any more”. Creepiest of all is Jeff who’s looking for someone on the wild side and would like to stay awake at night and “watch you sleep”. “I’d like a good-sized woman, but not that way good, this way good,” a bald Frank exclaims, while gesticulating with his hands above his head just to make sure he doesn’t attract any fatties.